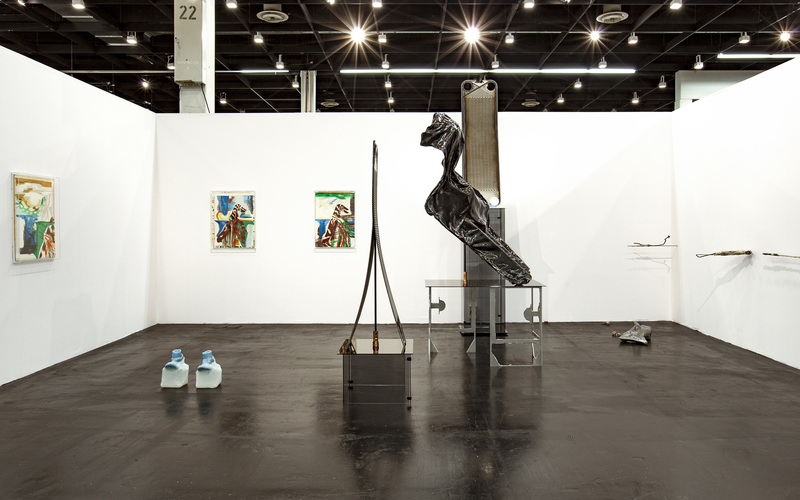 Markus Lüttgen is delighted to participate in Art Cologne 2017, where we will present a carefully curated booth by David Jablonowski entitled “Public Hybrids”. Reflecting the current state of Dutch sculpture in its poly-formal gradations, the selected works by Marien Schouten, Jennifer Tee, Adriano Amaral, David Jablonowski and Giulia Cenci highlight the omnipresent phenomena of copying in artistic practice. Questioning repetition and material matter through multiple forms of interpolations of layers, the original source-materials and their meanings become intertwined in a vivid play with hybridization. High-tech material like carbon, perspex and resin that indicate labor-related working processes contrast aspects of fluidity and the ephemeral nature of material present in the use of marble dust or tulip leaves. Distinct procedures of creation and perception are also shuffled together in order to prompt different courses for association. Sculpture and it's forms, meanings and construction processes seem to embark on a new search to position the redefined significance of the material cycle. Hybridity analyzed as the key-motive connecting sculptures, drawings and ceramics also features this ritual of understanding material and form in its current state.